Happy hours are the sinew of the ICT4D community: They are how we connect. For a few hours each month, we put aside the titles, affiliations, competition, and enjoy each other’s company over a few drinks. September was a particularly busy month on the ICT4D happy hour calendar, so let’s take a quick look back on what happened. Hopefully, you’ll join us for the next one! What’s the general concept? 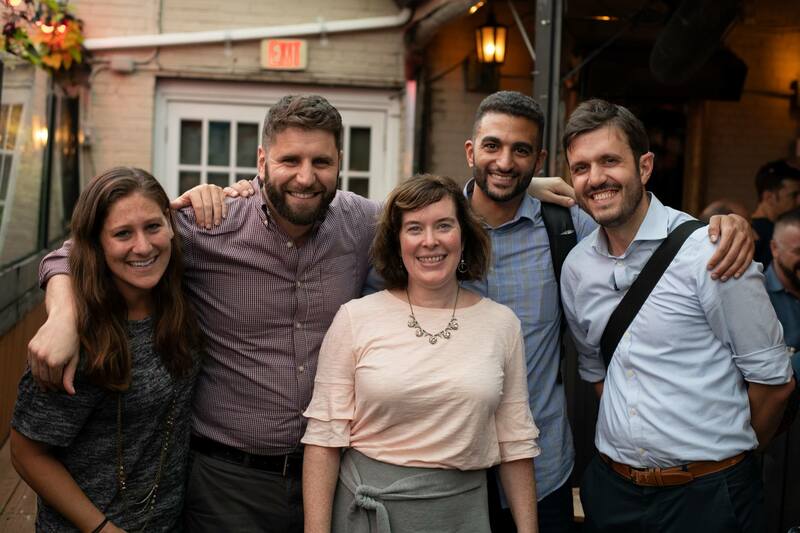 ICT4Drinks is the Facebook of the Washington, D.C., ICT4D community; everyone’s there! TechChange’s Nick Martin and Chris Neu play host, greeting at the door and passing out drink tickets over the din of a crowd that generally reaches 100+. ICT4Drinks is the place to find out who’s hiring, who’s funding what and why, and what’s coming next in ICT4D. What was this one about? TechChange and DAI co-hosted the September event, which focused on next generation development professionals, as per the recent research by DAI, the U.S. Agency for International Development, and Devex on the same subject. Talia Dweck, from left, your humble author, Krista Baptista, Karim Bin-Humam, and Greg Maly, all from DAI’s Center for Digital Acceleration. What’s the general concept? Tech4Dem is a bi-monthly gathering of technologists who work with governments, activists, businesses, and multilaterals to improve the quality of representative government around the world. It’s a more niche audience than the ICT4Drinks crew, and is centered around a brief technical presentation from an expert, as well as a brief Q&A. What was this one about? 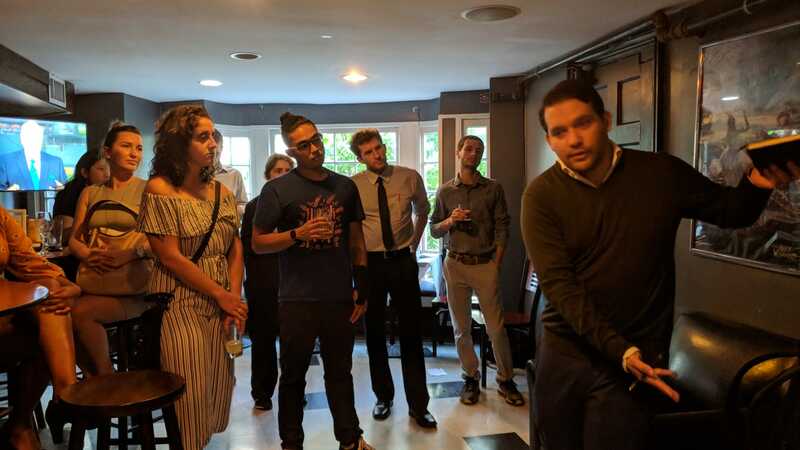 Tech4Dem hosted Julio Herrera, the Director of Red Ciudadana (Human Network), a Guatemalan nonprofit that uses open data and web apps to engage the public around critical issues of governance, transparency, and accountability. Who was there? Tech4Dem is popular with the National Endowment for Democracy organizations, which include the National Democratic Institute, the International Republican Institute (both co-sponsors), the Center for International Private Enterprise, the Center for International Media Assistance, as well as IREX and DAI (the other two sponsoring organizations). Beyond that, a wide range of free press and good governance-oriented organizations, consultants, and experts are regulars. Julio Herrera presents on Red Ciudadana’s open data work in Guatemala. What’s the general concept? HCD4D is the newest ICT4D happy hour. 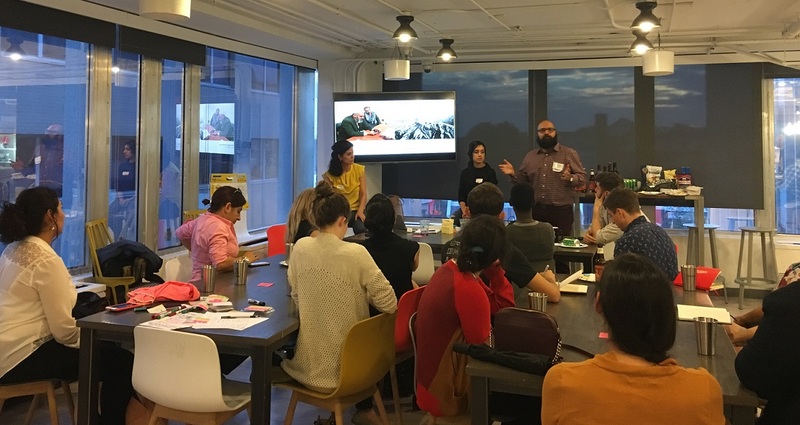 It’s run by a group of designers and aims to elevate the practice of human-centered design in the international development space. The founders believe that for technology to facilitate impact, it must be well-designed, and that good design hinges on a deep understanding of how a specific population uses technology, sees itself, and sees its social context. The happy hour is focused on sharing best practices and elevating the discussion about design among global development implementers. What was this one about? The inaugural event was a discussion of the distinctions between designing for domestic or commercial clients and designing for international development programs. Who was there? Souktel, Creative Associates, Dalberg, Forum One, IREX, DAI, as well as designers from a variety of tech companies and government agencies. Gina Assaf from Souktel, from left, Priyanka Pathak from Dalberg, and Ayan Kishore from Creative Associates presenting. Did I miss your favorite ICT4D happy hour? Is there an amazing ICT4D happy hour outside of D.C.? Let me know!